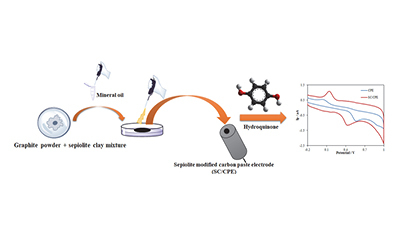 In this paper, a simple and sensitive electrochemical nano-sensor was developed for the analysis of hydroquinone based on sepiolite clay modified carbon paste sensor by using differential pulse adsorptive stripping voltammetry and square wave adsorptive stripping voltammetry. Surface morphology of sensors was characterized by using scanning electron microscopic technique, electrochemical impedance spectroscopy, and cyclic voltammetry. Electrochemical redox properties of hydroquinone were investigated by cyclic voltammetry. The oxidation peak current of hydroquinone in differential pulse and square wave adsorptive stripping voltammetry changes linearly in the concentration range of 0.01‒700 µmolL-1 and 0.01‒700 µmolL-1, respectively. Excellent limit of detection (LOD) and limit of quantification (LOQ) values were found as 0.01096 µmolL-1 and 0.03654 µmolL-1 for differential pulse, and 0.01031 µmolL-1 and 0.03438 µmolL-1 for square wave adsorptive stripping voltammetry, respectively. Additionally, the newly proposed sensor was applied to the analysis of hydroquinone in cosmetic cream with satisfying results.